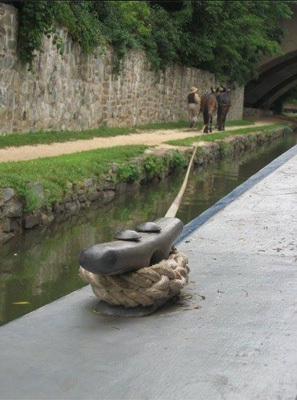 Within its 20,000 acres, the C&O Canal National Historical Park (NHP) tells the story of 19th and 20th century America. It protects, of course, what was once an active transportation link between the coalfields of the Allegheny Mountains and the urban markets at the upper reaches of the Chesapeake Bay. The significance of this connection was first appreciated by George Washington, who spent much of his private life surveying and speculating on land in the Potomac headwaters. He knew that linking the Potomac to the Forks of the Ohio (present-day Pittsburgh) would connect the young, coastal nation to the vast resources of the continental interior. Though construction began in 1828, the canal wasn’t completed until 1850, several years after the B&O Railroad had already reached Cumberland. The canal couldn’t compete with rail in terms of speed or capacity, and so it was nearly obsolete from the time of its opening. Only bulk commodities, like lumber, wheat and especially coal, ever depended to any large extent on the canal for access to markets. Nevertheless, the canal operated (with only occasional interruptions in the wake of especially devastating floods) until 1924 when a damaging flood destroyed it beyond repair. People continued to live in cabins and shanties along the canal for another 45 years, until the national park was established in 1971. The canal’s transportation history is particularly evident along the stretch from Seneca to Georgetown where the National Park Service (NPS) has made an effort to keep it watered. While the park provides an unparalleled glimpse into the history of the canal era, it is equally valuable, though far less appreciated, as a repository of the history of Native Americans, the Civil War and slavery, westward expansion, immigration, industrial development, the New Deal, and the conservation movement. All are important elements of the American experience. The C&O Canal is blessed with an extraordinary collection of physical evidence of its rich history. Within the park can be found over 1,300 historic structures in various states of repair, ranging from sublime (the Paw Paw Tunnel) to ordinary (culverts) and from elaborate (Ferry Hill Plantation House) to rustic (over two dozen lockhouses). Floods, neglect, and even looting have taken their toll over the years. Even so, fully 5 percent of all historic structures within the entire National Park System are located in the C&O Canal National Historical Park.